Craig-y-nos Castle: Valerie Brent and Susan Davies- surprise! Susan, a former child patient in Craig-y-nos in the early 1950s had a double surprise the other day. 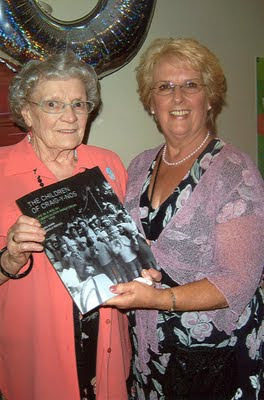 For her family gave her a surprise 70th birthday party and retired nurse Valerie Brent, the star guest presented Susan with a copy of "The Children of Craig-y-nos". Valerie says:" Susan was unable to make the book launch but she did come to the reunion the year before. She hadn't been able to get hold of a copy of the book so I got her one and gave it to he. She was absolutely delighted." I could not make the Exhibition.